THE PINK TANK: The Sunday Post: To cancel or not to cancel? I was reading this article a few weeks back, where Pandora and Dolly from The High Low write in Red Magazine for and against canceling or 'flaking' around the Christmas season. I'm definitely team Polly on this issue. Whereby, it's okay to cancel, or flake, and I am okay being the person that is canceled on. In fact, I had one of those scenarios yesterday. After a long, stressful week of the 9-5 (well 5am - 6pm if last week is anything to go by!) I was completely shattered and made the honest cancellation call to a few people very close to me. Needless to say, they were completely understanding, something I hope I extend to cancelers in my own life! Let me back track a minute - I mean, I get that this happens. Some people are super prepared with plans, other crop up last minute posing a problem of commitment vs. preference, other times, you just don't fancy doing anything, don't have an excuse and aren't sure how to break it. You've already committed to one and need to back out or really want to go to the other - it's tricky. Let's take this scenario (this is a generic example FYI): a hot date comes in and instead of going against all 'girl code' rules an canceling on your friend for a guy, you fake a headache that frees you up to go on the date. Okay - fair enough. But remember, don't post your drinks boomerang on social media, don't go to the bar frequented by your canceled bff. In short, I'd say 'fess up as soon as you can or commit to your original plan. Chances are if you don't 'fess up, you'll forget you canceled and end up telling your bff about the hot date you had on Tuesday...which could end awkwardly. If the receiver of the cancellation is close enough to you and you respect them enough, they will understand and you can reschedule. They will value your honesty, which is important in any relationship and speaking from my own experience this week, I'd rather the honesty policy - it's not nice for anyone to find out third hand they were runner up. 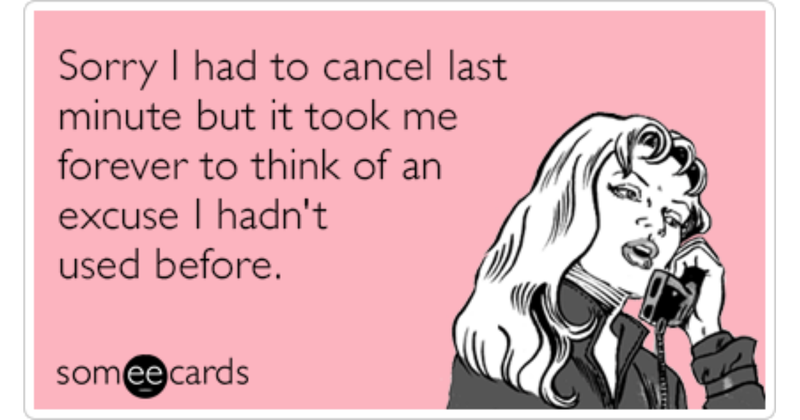 Which side of the fence are you on when it comes to canceling? !